The legislation sets high-level goals for NASA and directs the space agency to continue development of the Space Launch System heavy-lift rocket, the Orion crew capsule, and a deep space habitat to house astronauts on voyages beyond Earth orbit. 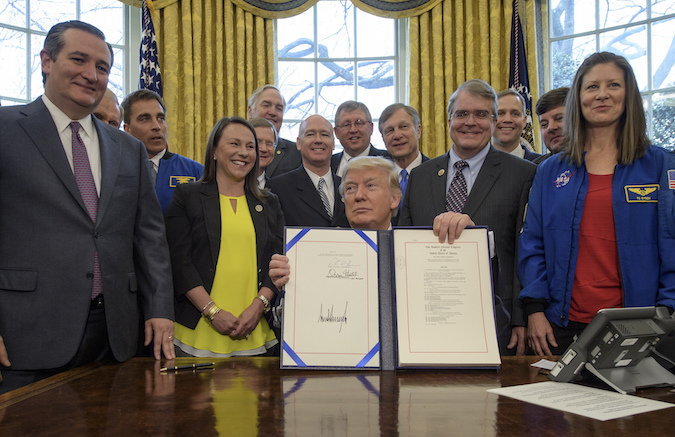 The NASA Transition Authorization Act of 2017, passed by the Senate and House on Feb. 17 and March 7, is the space agency’s first new authorization signed into law since October 2010. With minor tweaks, the bill maintains NASA’s trajectory toward deep space exploration and commercialization crafted during the Bush and Obama administrations in the aftermath of the space shuttle’s retirement. Vice President Mike Pence said after Tuesday’s signing that he will chair a newly-chartered National Space Council, a White House-level space policy coordinating committee last active during President George H.W. Bush’s administration. In addition to maintaining support for the SLS and Orion programs, the authorization act has provisions for a detailed report on NASA’s plans to develop and demonstrate key technologies needed for a human mission to Mars, including a list of precursor missions in cis-lunar space, the region around the moon. NASA will also commission an independent, non-governmental study on a Mars human space mission that could be launched in 2033, examining the technical and budgetary requirements of such a flight. The authorization act also supports the International Space Station through at least 2024, with provisions to study a possible extension to 2028 or 2030, and the commercial crew and cargo programs to transport astronauts and supplies to the orbiting research outpost. “This bill will make sure that NASA’s most important and effective programs are sustained, and orders NASA to continue transitioning activities to the commercial sector, where we have seen great progress,” Trump said. “I am grateful for the president’s action today which will restore stability and certainty to NASA and the future of the U.S. space program,” said Sen. Ted Cruz, R-Texas. 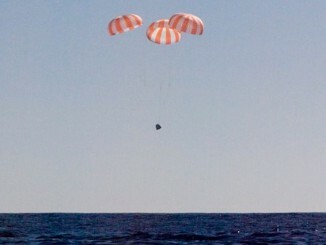 But Elon Musk, the chief executive of SpaceX, said the bill would do little to accelerate a mission to Mars. SpaceX’s long-term goal is to send people to Mars, and Musk unveiled an audacious concept last year to begin setting up a habitat on the red planet with commercial interplanetary spaceships and huge rockets, not with the government-backed SLS and Orion. 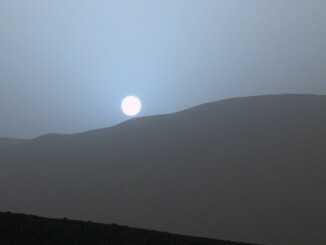 “Perhaps there will be some future bill that makes a difference for Mars, but this is not it,” he later tweeted. The bill signed by President Trump on Tuesday authorizes $19.5 billion for NASA in fiscal year 2017, but a separate appropriations bill is required to approve the agency’s budget and determine the level of funding each of NASA’s programs will receive. The legislation questions the utility of NASA’s Asteroid Redirect Mission, a concept that would send a robotic spacecraft to pluck a large boulder off a near-Earth asteroid and return the sample to the vicinity of the human for visits by astronauts. Congress has never fully supported the idea, and independent reviews have concluded the technologies that would be validated on such a mission, such as high-power solar-electric propulsion, could be tested in other ways before a crewed expedition to Mars. In the authorization act, lawmakers ordered NASA to write a report on alternatives to the Asteroid Redirect Mission for demonstrating such technologies. The White House’s fiscal year 2018 budget blueprint released earlier this month calls for the cancellation of the Asteroid Redirect Mission. Lawmakers also authorized NASA to provide for lifetime medical monitoring and treatment of former astronauts for conditions potentially associated with their service in the space program. 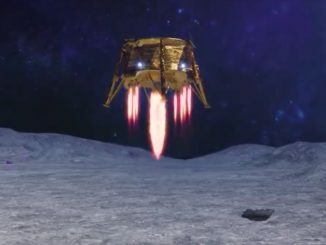 NASA’s robotic missions also received support in the authorization act, which specifically identified the James Webb Space Telescope, the Wide Field Infrared Survey Telescope, the Mars 2020 rover and a probe to study Europa as top priorities. Congress also called for NASA to continue working on a “balanced” set of small, medium and large robotic science missions. The space agency’s senior reviews, which decide which of NASA’s extended science missions should continue to receive federal funding, will occur every three years under the provisions of the authorization act, not every two years as they do now. Scientists say the change will give them more time analyzing data and operating missions, instead of writing proposals. Some lawmakers criticized the authorization act for not specifically addressing NASA’s Earth science and heliophysics programs, but it garnered bipartisan support, passing the Senate by unanimous consent and the House with a voice vote. Other parts of the authorization act direct NASA to identify spacecraft that could be aided by satellite servicing missions, and to solicit and review concepts to remove space junk from orbit.